No need to worry about Shroeder's contract at the moment, he is still on his rookie deal and will be for the next 2 years. Yep. I got a year ahead of myself. So far looks like it's Jahlil Okafor and Emmauel Muniday(Congo) then it's everyone else. The Kentucky boys looks like most people have cooled off on them so far. Just was over at NBA Mock Draft.net and last time I was there Karl Anthony Towns was high as #3 now he's down to #6. Still think the Pick is going to be C or SF as of right now. If Nets don't continue freefalling it will be Frank Kaminsky (Wisconsin) if they do I have no earthly idea right now. two things that also popped out looked at regular mock, and then the consensus mock looks like Trey Lyles and Justin Winslow(according to them) might be taken way to high because of where they play. It's just an interesting thing to look at though at this point. Just bumping this thread, but need to take a closer look at the Virginia Cavs Boys. Think also our floor/ceiling is 13th/7th so if anyone can look into. Kaminsky would fit well, but ANOTHER C might be an issue. How many big guys are we gonna fail on? Bebe, Moose, Payne, Tavares, Kaminsky or Turner? In 3 years? Thats a lot. Thats Knight and SF territory. Well we don't know if they've failed yet at least I don't think, but you do bring up a good point. I've heard though Tavares was far better than Bebe could dream of being though, and we'll just have to wait and see. Hey it's Bud he's worked extreme wonders last year and so far this season as well. Kaminsky though I think he's the pick we might even trade back something tells me that's what will happen, but I can't leave out those Virginia boys just yet, and no clue on anyone Arizona. Why not get hopes on Cauley-Stein? Well if they're not failures, taking another big guy is even worse haha. And cauley stein will be top 5. You sure(I hope it doesn't happen) cause by most accounts at least far as Mock Drafts have gone he's been outside Top 10 for most a good bit this year heck his teammate who I've really haven't heard nothing about. Talking about Karl-Anthony Towns is the one that's Top 5 right now. Highest I've seen for Cauley-Stein has been as high as 6th DraftExpress and low as 15th HoopsHype, NBA Mock Draft.net think had him 11th last time I checked. Thats interesting. His block numbers are way down this year with more minutes. He's also a 50% career Ft shooter but he's getting better every year. I dont think he fits for the Hawks anyway. Pretty much just a defensive specialist and he's like Payne in that most of his development is behind him. We need to come away from this draft with a quality wing. Bazemore is the only guy on the entire roster with potential 3 years from now. Demare and Kyle aren't gonna last forever lol. You're correct on that, but if that's the case I'm with you talking Harrell then, and if someone without a doubt we could trade up get Stanley Johnson lol. Kennedy Meeks fits all the hawks boxes, but a kid that size just scares the piss outta me. What are all the hawks boxes, what do the hawks look for in a player? And how in the **** does the hawks have the right to swap picks with the nets? Cause Budenholzer is a G! You haven't been following the Hawks much if you have to ask. It was a part of the Joe Johnson trade. Monta Ellis will probably opt out of his contract. I hated him 2 years ago, now I think he would be a great addition to our backcourt. Other guys that I have my eyes on are Omer Asik and Wesley Matthews. Is Matthews on the trade block or supposed to be a free agent this summer? He's tailor made for our system. It'd probably be the end of either Korver, Teague or Dennis though. My dream scenario would be to bring him in whenever Korver begins to slow down but can still play off the bench. I think if we get the Nets pick we take Stanley Johnson or Winslow. They both fit the attitude and Bud could improve their shooting percentages. the ESPN lottery simulator which we almost never win (currenly 0.8% chance to have #1 pick) has us taking the SF from Duke - Winslow - everytime. Yeah he fits exactly what we need. I like Johnson a little bit more because he looks like he has a little better chance to be a number one scorer, but Winslow is a great teammate and fits in perfectly to the Bud mold. 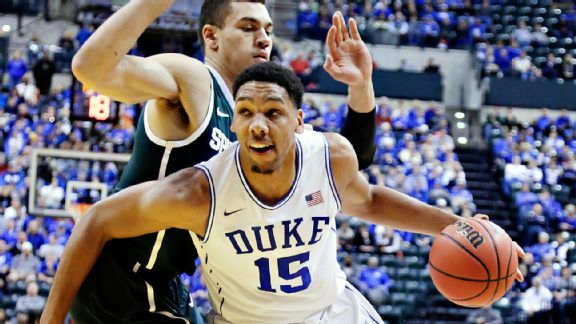 1) Atlanta Hawks - Jahlil Okafor, C-Duke (6'11", 275lbs) Already a polished low-post scorer at 19 years old, Okafor has a vast array of moves to go along with his size, soft hands, excellent footwork and high basketball IQ. The only real knock against him is that he's not an elite athlete. He can struggle to move well laterally and is only an adequate rim protector. I had to press the draft simulator button about 50 times for the Hawks to get the #1 pick. Wanted to enjoy it - LOL. It is Okafor of course. Damm g-dawg lol, man but wouldn't it be nice!!! Thanks, those look like great traits to look for in a player. I think i could actually watch the Hawks type of basketball..
You are correct, i watch 4 to 5 hawks games a year and usually only if they make the playoffs!! I love that the hawks appear to be a TEAM, of selfless players that want to win and don't have the massive ego that requires them to be the one always taking the shot. So just asking a question how would anyone feel if we trade back for both Frank Kaminsky(That might be a risk as his stock continues to go up) and Sam Dekker his teammate from Wisconsin? I was looking at the Wis/Penn game a little yesterday Dekker is a 6-9 SF and he was playing pretty good from what I can tell still need flim/highlight of him, but it's just a thought not saying we got to. I still think Kaminsky is the pick this late into the season I'd be shocked if he isn't.